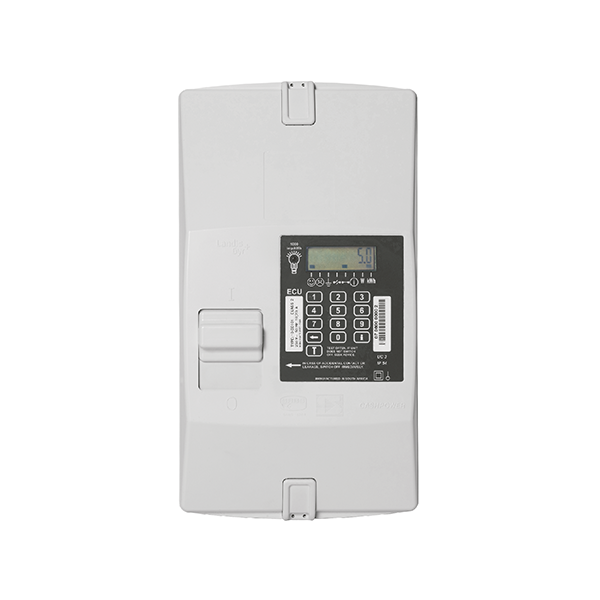 The new generation Landis+Gyr Keypad Prepayment ECU is a compact, single-phase, two-wire, keypad-based prepayment electricity meter in a housing compatible with the ESKOM standard common base electricity dispenser socket. The ECU which has built-in earth leakage and over current protection, is most suited to new reticulation and is directly and easily interchangeable with common base prepayment meters from other approved manufacturers using the common base configuration. User interaction with the meter and access to meter information (such as a low credit warning, energy consumption and load contactor status) are available using the keypad and LCD display. The ECU meter is based on the ESKOM specification which calls for a prepayment meter that can be fitted into a standard plug-in base. This concept ensures simple installation and replacement procedures. The meter is keypad-based and supports the industry-standard STS encryption algorithm. Access to meter information is available using the keypad and LCD. More detailed information and programming is achieved via the standard interrogation port at the rear of the meter, according to the defined ESKOM specification. Integration of a supply isolator, earth leakage protection and over current and short-circuit protection into the prepayment meter eliminates the need for a distribution board in the house, thereby reducing overall installation costs. The ECU is fitted with a 2-pole circuit breaker which disconnects both live and neutral poles. Apart from the meter’s programmable Power Limit functionality, it is also protected against over current and short-circuit currents by means of a thermal-magnetic trip mechanism in the live pole of the circuit breaker. Electronic earth leakage detection protects against residual currents (earth leakage fault currents) by tripping the circuit breaker. This protection circuitry is independent of the metering circuitry for improved reliability and rapid response times. A dedicated earth leakage test key (T) is provided for consumers to regularly verify the integrity of the protection circuitry. The ECU electronic circuitry is mechanically sealed at the time of manufacture by screw sealing plugs. These plugs will be destroyed if attempts are made to access the screws. On installation, the ECU is secured to its socket base with two screws. These screws are then covered with a plastic anti tamper plug and finally sealed with a sealing wire and crimp ferrule clearly visible from the front of the meter. This ensures that there are visible signs of tampering if unauthorized entry to the system is attempted. In addition to the mechanical sealing of the meter, the external lever mechanism of the circuit breaker is completely covered by a plastic shroud to prevent the insertion of foreign objects in an attempt to damage or disable the mechanism. The plug-in-base which conforms to ESKOM’s specifications, allows for commissioning of the meter to be separated from the field installation, adding flexibility and convenience to these processes. Included with the base is a Metal Oxide Varistor (MOV) which ensures that the meter complies with the stringent ESKOM requirements for surge current protection of prepayment meters. The base is optional and can be supplied separately to the meter. Complies fully with the latest VTC port requirements as specified in IEC 62055-52.